1/25/2017 - Path to Stone Rain is the spell form of Ghost Quarter. 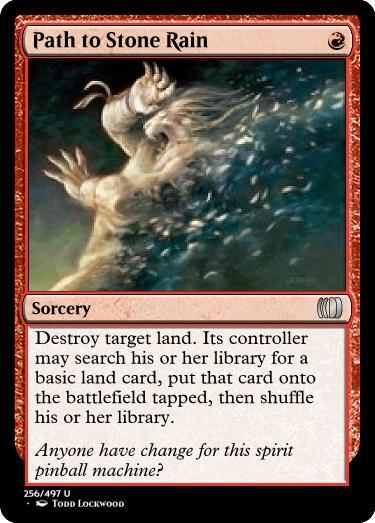 It's a Stone Rain that uses the Path to Exile downside, which turns it from mana denial to utility-land denial, something red is known for. Path to Counterspell came from wondering what other old cards Path to Exile's downside could help justify. 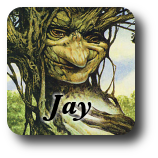 I'm reminded by Dave Chalker's suggestion of a "Path to Thoughtseize"—which I totally dig—that I was going to invite you all to suggest other uses of this tech. Path to Dark Ritual would be very interesting in a non-Storm format. Hmm. I get +BB this turn, and you get +M every round thereafter? Path to Stone Rain is just Ghost Quarter, no? Solid card but doesn't break anything. It's a Ghost Quarter that doesn't cost you a land, but I agree. What does Path to Mental Misstep cost? The same I think, though one could make the argument that it's more likely to be "fixed" for sure at U.
I seriously proposed "Destroy all permanents. For each land destroyed this way..." as a card on Multiverse. I could also see "Destroy all creatures. For each land destroyed this way..."
Hm. From the Ashes was nonbasics-only, but I could juuust about see an "all lands" variation on it. Lesson: When coming up with a wacky over-the-top effect, check to see if someone already snuck it into a Commander set. Path to Savor the Moment? On second thought, maybe this is too non-interactive. How about Path to Overloaded Cyclonic Rift? The land does help them recast their hand. Do they get a land for each creature? Sounds neat but hard to balance. New Frontiers was the original, right? In that I get X lands, but so do you? Sure.